An international team of scientists has discovered a new, massive star system–one that also challenges existing theories of how large stars eventually die. “This system is likely the first of its kind ever discovered in our own galaxy,” says Benjamin Pope, a NASA Sagan fellow at New York University’s Center for Cosmology and Particle Physics and one of the researchers. Specifically, the scientists detected a gamma-ray burst progenitor system–a type of supernova that blasts out an extremely powerful and narrow jet of plasma and which is thought to occur only in distant galaxies. The discovery of the system, reported in the journal Nature Astronomy and dubbed “Apep,” also included scientists from the Netherlands Institute for Radio Astronomy, the University of Sydney, the University of Edinburgh, the University of Sheffield, and the University of New South Wales. The system, an estimated 8,000 light years away Earth, is adorned with a dust “pinwheel”– whose strangely slow motion suggests current theories on star deaths may be incomplete. 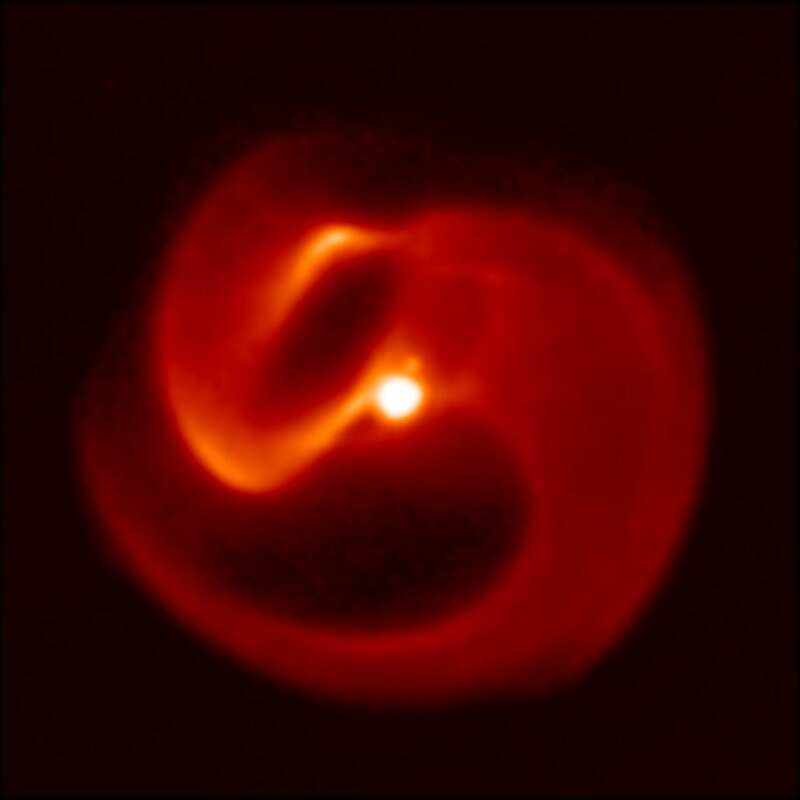 Images of Apep, as well as a video rendering of system, may be downloaded here: http://www.physics.usyd.edu.au/~gekko/apep.html. When the most massive stars in our universe near the end of their lives, they produce fast winds–typically moving at more than 1,000 kilometers per second–that carry away large amounts of a star’s mass. These fast winds should carry away the star’s rotational energy and slow it down long before it dies. “These massive stars are often found with a partner, in which the fast winds from the dying star can collide with its companion to produce a shock that emits at X-ray and radio frequencies and produces exotic dust patterns,” explains Joseph Callingham, a postdoctoral fellow at the Netherlands Institute for Radio Astronomy and lead author of the paper. The work was performed, in part, under contract with the Jet Propulsion Laboratory, funded by NASA through the Sagan Fellowship Program, which is executed by the NASA Exoplanet Science Institute. For more on the discovery of Apep and how the scientists came to understanding of the system outlined in the paper, please visit Nature’s “Behind the Paper” blog post (live after the embargo lifts): https://astronomycommunity.nature.com/users/sign_in.